What’s a fest without true test of your physical strength! 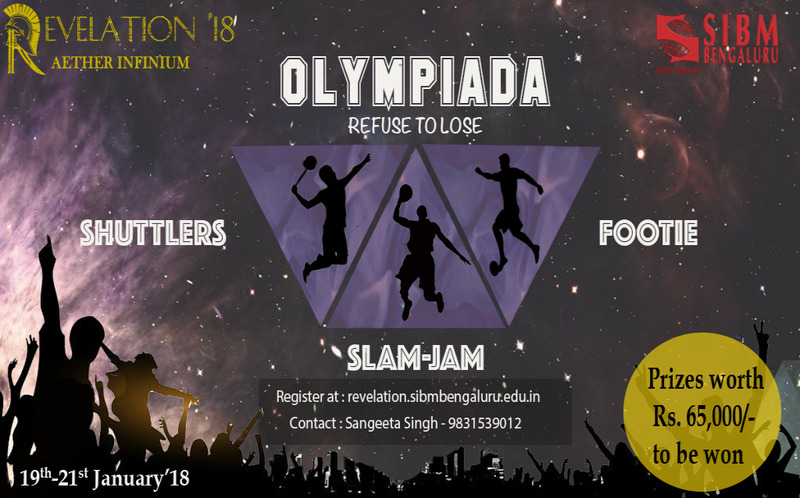 Revelation 2018 presents to you ‘Olympiada’- The sports vertical of Revelation- Aether Infinium. For showing off your amazing dunking skills- we have Slam Jam, if you can shoot a ball right across the field- we have Footie and to test your reflexes- we have Shuttlers. So, come show us what you’ve got. With exciting cash prizes up for grabs, these 3 days will be nothing less than an adventurous joyride. Compete with talents from institutions spread across the nation and get a true taste of what it’s like to emerge victorious among victors. So tie up your laces and gear up for Revelation 2018. See you where your limits meet infinity.